I'm the world's worst kite flier. It's official. I spent most of my childhood running up and down beaches with sticks, cloth and string. I had not got a clue and neither, it seems, had any of my aunts, uncles and other relations. Perhaps it runs in the family? So, why am I telling you this? The reason is simple, I reckon that I'm uniquely well qualified to talk about the subject. After all, if I can get a kite to work then you will be sure to be able to get it to work better! they have no rigid parts whatsoever to get broken. 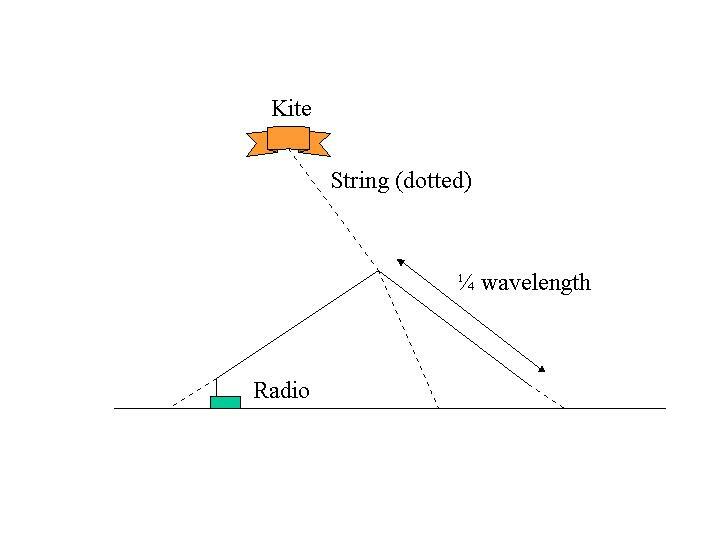 The traditionalists use box kites (I think Marconi started that off) but I knew that I would never get one of them into the air! My kite arrived and I set about testing it. The amazing thing was that I could launch and fly is easily - I have NEVER had to run with this baby. And what's more it performed exactly as the sales literature said. Bliss. After a while I got to flying it in stronger winds and then on one sad day, the 100 pound breaking strain line broke. Off sailed my kite, landing in a field of wheat. There was no chance of finding it. I wrote to Mr Jalbert and explained that I was hoping to take the kite to VP8 and that his recommended breaking-strain line had broken. By return, he sent me a new kite - no charge. That's good service! Anyway, some months later, the wheat field got harvested and the harvester driver actually spotted the kite and retrieved it in tact. That was 1981. I have both kites here to this day. Don't choose a kite that is too big. Mine seems to be about the right size for most aerial applications. The bigger ones will be impossible to handle in anything but a light breeze. Bigger is NOT better here! So here is the first lesson. Spend some money on a really good kite (a Parafoil) and it will last for a long time and do great service. Suitcase packed, off I headed, with my kites in tow. Boy was it windy. I set about trying to break the endurance kit flying record. It was a windy day and I managed about 18 hours before the wind really got up and the string broke again. However, there was not a wheat field for some distance so I managed to get the kite back. Parafoils need the tension of the string to fly. Once the string breaks the fly like a stone. Quite a handy characteristic. On a field trip. I launched the kite from my sledge and called the base. they were rather surprised to get a call during the day but the kite certainly enabled me to put up a good aerial. I have a picture of this event which I must scan in some time. 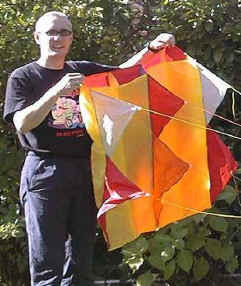 I also used the kite to launch an aerial to make some QSOs on 20 metres - reaching back to the UK with just 8 Watts of SSB. So the kite was a success. There are several choices. 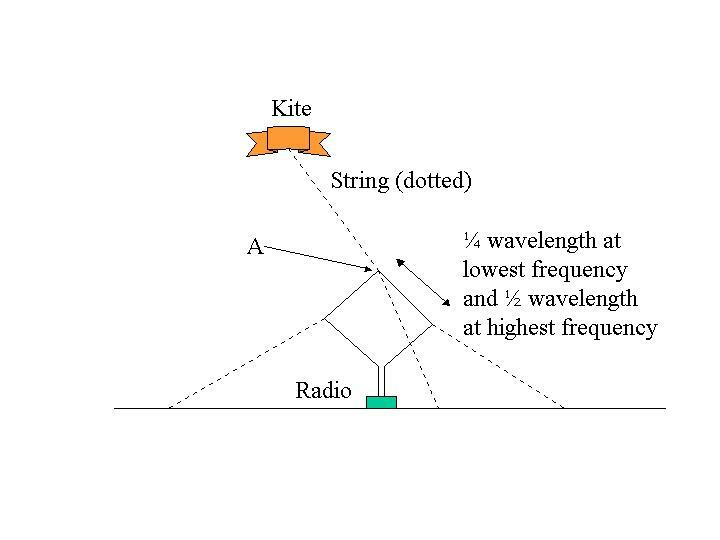 The most obvious is to use an end fed wire as the "string" for your kite. However, as the wind varies, the angle and direction will change (often a lot) which can be undesirable. I tend to hang a wire of the string, about 100 feet down from the kite. This gives a vertical aerial that is much more stable. Add a few radials and a tuner and you're in business. With two kites, you can be more ambitious and I have flown a large inverted L before. However, my 80m 5/8 wavelength vertical seems to have been the best performer. Some further thoughts are to use an end-fed half-wave inverted vee configuration with the feed point at ground level and the current point at the peak of the vee. This would be a good choice for near vertical incidence communications on the lower band and DX on the higher band (say 40m and 20m). I did a test run of the configuration above on 4th July 2001. The aerials seems to work adequately. 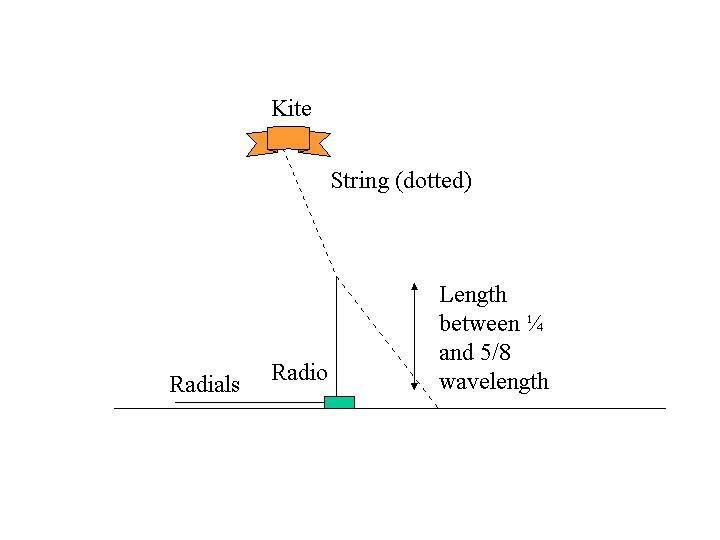 The kite needs to be well above the apex of the aerial to be clear of the vortices that exist around hill tops. Aim for 150 feet above the ground before the aerial is attached. A further option would be a diamond aerial. This can be used on two frequencies (an octave apart) by simply opening or closing the circuit at point A. With a short at point A it would work on the lowest frequewncy (7MHz for example) while an open circuit would allow the aerial to work on 14MHz. This would be a useful scheme for K1 40/20 owners. The loop can be fed with open wire line. Avoid power lines. Avoid aircraft (my kite has been up to over 1000 feet). Avoid lightening. Avoid static rain. Any or all of these could get someone killed. Jalbert Aerotechnology don't seem to be on the web so perhaps they have gone. There are however other Parafoil manufacturers about. 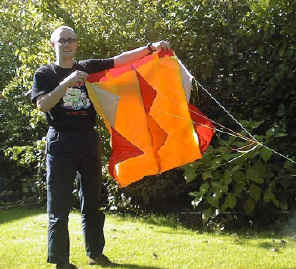 More general information about parafoil kites here. Sources of kites on the WWW - you judge if they are ok!